Although the focus is on crossovers nowadays, those shopping for inexpensive transportation will find their best options in the subcompact-car segment. And that’s right where Hyundai’s Accent plays. The tested top-line Limited comes with 17-inch alloy wheels and a host of features, yet still lists for less than 20 grand. We published our First Spin of the redesigned-for 2018 Accent last fall, but we can now add some additional impressions based on a recent two-week test. 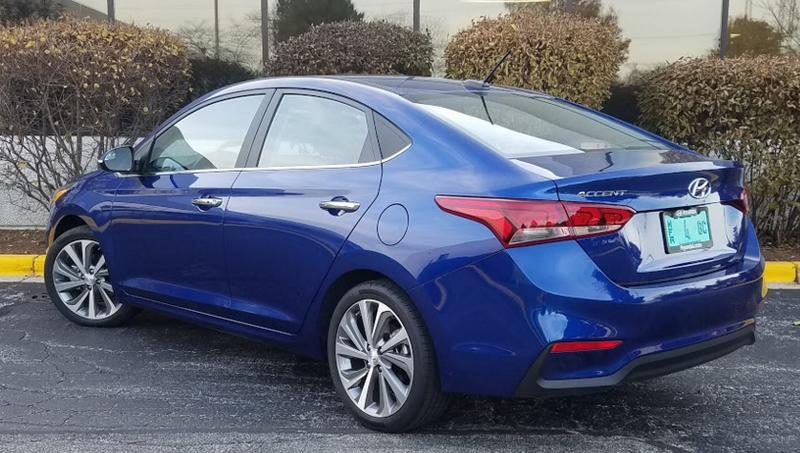 What came through our office was a top-line Limited sedan (the former hatchback has been dropped) that bottom-lined at $19,780. If that sounds like a lot to those looking for “inexpensive transportation,” note that the base SE starts at a more palatable $16,880 including destination when equipped with automatic transmission ($1000 less with manual). Yet that means you’d be missing out on all our Limited’s added features, including Apple CarPlay/Android Auto functionality, 7-inch (vs. 5-inch) touchscreen, satellite radio, dual charging USB ports, automatic headlights, heated mirrors, and telescopic (not just tilt) steering wheel — all of which come on the mid-level $18,180 SEL — along with 17-inch alloy wheels, keyless access and starting, heated front seats, power sunroof, hands-free trunklid, automatic climate control, and forward collision warning and intervention. So quite a lot for less than $3000 more — and less than $20,000 total. There’s good space available in front, but if taken full advantage of, legroom in back virtually disappears. However, normal-sized folks sitting in tandem should find sufficient room. Aside from accessories such as floormats, the Limited offers no options, so you simply can’t get items such as leather upholstery, lane-departure warning, or blind-spot/rear-cross-traffic alert. You’re also resigned to rather budget-grade interior materials (just hard plastic on the dashtop, doors tops, and door armrests), an engine that gets loud and buzzy under even normal acceleration, and rather high around-town bump noise (though the Accent is reasonably quiet on the highway). Despite the car’s small size, one of our tall testers found sufficient room up front, but there was virtually no rear legroom behind him; however, two average-size folks could likely sit in tandem. Accent’s trunk space is reasonable, and our Limited’s hands-free power trunklid was an unexpected nicety. 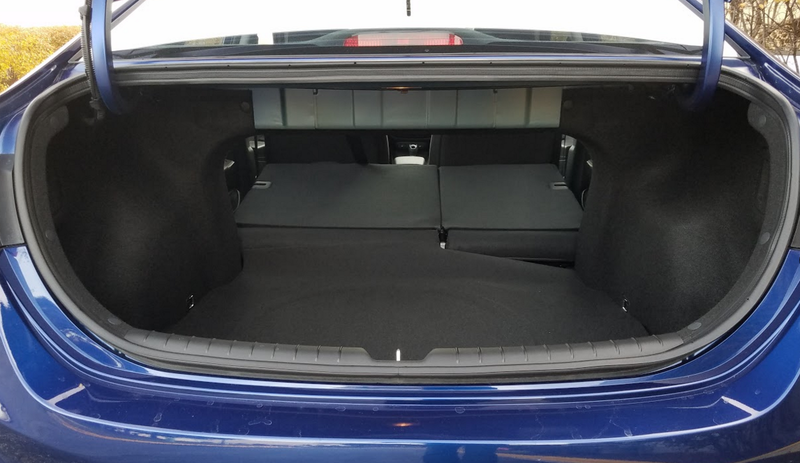 However, the lid hinges dip into the load area, there’s virtually no under-floor storage save for some “unofficial” space around the spare tire, and when folded, the rear seat backs rest about five inches above the level of the cargo floor, so you can’t easily slide long items forward. A piece of cloth hides the 5-inch step between the cargo floor and the folded rear seat backs — which does more for appearance than for functionality — but we were truly impressed with the hands-free power trunklid, a very upscale feature for this class that comes standard on the Limited. But many of those negatives would apply to most cars in this segment, as they are — almost by definition — small and built to a price. And there’s plenty about the Accent that could be considered strengths. First is the list of aforementioned features offered. 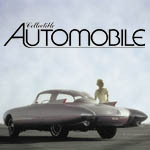 Next is the fact that while loud, the little 130-horsepower 1.6-liter engine provides decent if hardly exciting acceleration, and the 6-speed automatic transmission kicks down fairly promptly when the throttle is stabbed at speed — a real asset in the cut-and-thrust of city driving — though highway merging takes some patience. Also notable in our city driving was the fact that the suspension soaks up most bumps quite well, something that has not always been a Hyundai strong point. 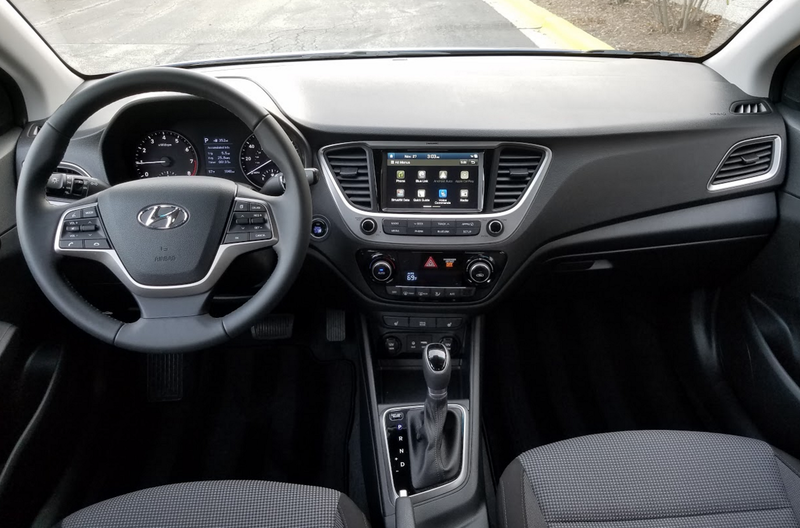 Although little padding was sacrificed in trimming the Accent’s interior, the control layout is commendable, as are such features as automatic climate control, satellite radio, Apple CarPlay/Android Auto functionality, and heated front seats. We also liked the Accent’s overall visibility and simple control layout. The latter is highlighted by audio volume and tuning knobs (not always present nowadays) joined by a number of handy physical buttons (ditto), along with fairly easy-to-use climate controls, all mounted within easy reach. Interior storage is only par for the course, though Aux/USB/and two 12-volt plugs are conveniently situated in a large forward console tray. Although one of the expected “perks” of a subcompact car is great fuel economy, we didn’t quite manage to hit even the Accent’s 28-mpg City EPA rating, despite the fact that a third of our driving was on the highway. However, there were also a lot of short trips in cold weather — a combination that is no friend to fuel economy — so our 26.6-mpg average can be considered fairly good overall. Consumer Guide’s® Best Buys in the subcompact segment are the bargain-priced Toyota Yaris iA sedan and the roomy Kia Soul hatchback. But if you want a sedan — and it appears most car buyers do — the former offers a very limited slate of features, leaving the door open for competitors such as the Chevrolet Sonic, Ford Fiesta … and Hyundai Accent. Although many buyers are gravitating toward crossovers, what they often find is that — feature for feature — cars end up being much better values. 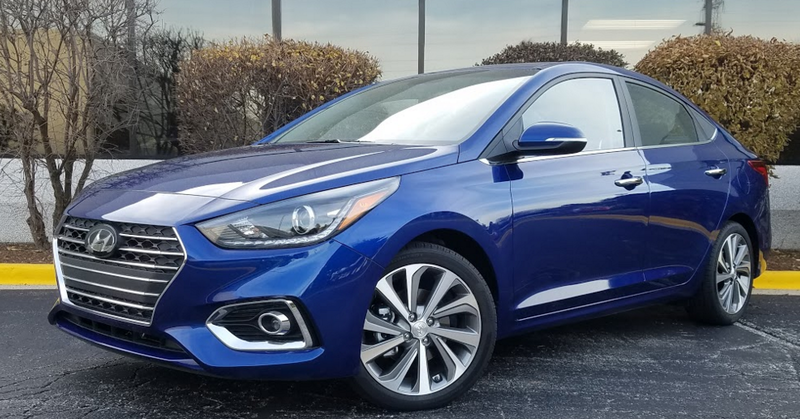 That’s particularly important in the low-price field, which is one reason Hyundai’s redesigned Accent is a strong player in the bargain arena. Written by: The Daily Drive staff on January 30, 2018.